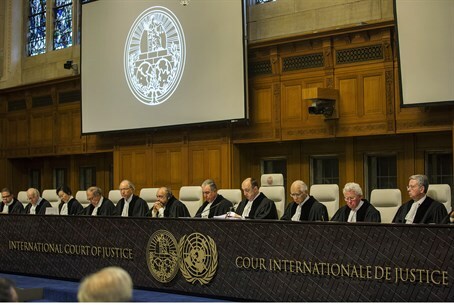 ICC says PA and Hamas must resubmit charges against Israel, which would leave them open to war crimes charges as well. A report on Monday reveals that America and other Western countries are pressuring the Palestinian Authority (PA) not to carry out its threat of suing Israel at the International Criminal Court (ICC) for "war crimes." PA Foreign Minister Riyad al-Maliki last Saturday threatened "we will go to the ICC, and put our signature on it. Very soon we will be a (sovereign) state. That is enough for the court to start an investigation." However, citing inside sources in the ICC and among the PA's lawyers, The Guardian reports strong US and Israeli pressure on PA Chairman Mahmoud Abbas not to take such actions, or else risk cutting his own purse-strings. The report comes as tensions have been rising between Israel and the US; just last Wednesday night reports revealed that US President Barack Obama's administration blocked a weapons transfer to Israel, and ordered greater scrutiny on future transfers. ICC prosecutor Fatou Bensouda said the PA needs to submit a new declaration, and cannot resubmit the 2009 charges of "war crimes" against Israel in then-Operation Cast Lead, a complaint that was rejected because the PA has no status as a state. Luis Moreno-Ocampo, who was ICC prosecutor during the 2009 lawsuit, told The Guardian "if Palestine wants to accept jurisdiction, it has to submit a new declaration." Such a declaration would first require the PA and Hamas to reach a consensus following their unity pact, and would also leave them open for investigation of "war crimes," not just Israel. Indeed, Hamas has openly been using Gaza citizens as human shields, even exhorting Gazans to serve as human shields in TV messages. "I heard all the arguments. I received different Oxford professors who were explaining the different and many times opposing arguments, and I concluded that the process should...go first to the UN. They should decide what entity should be considered a state," Moreno-Ocampo added to The Guardian. In a recent interview, the PA's envoy to the UN Human Rights Council (UNHRC) admitted the PA has no hope of pressing charges against Israel in international courts, because PA and Hamas terrorist groups are far worse violators of international law themselves. The UNHRC has itself launched a committee to investigate "war crimes" allegations against Israel, an investigation that Nobel laureate Professor Yisrael (Robert) Aumann on Monday said amounted to anti-Semitism.